On the afternoon of the 11th day of the First Month of Tibetan Iron Snake Year 2128, during the first week of the auspicious Miracle Month, Venerable Lama Chimed Namgyal, wearing his robes and sitting in the meditation position, passed from this earthly realm into parinirvana and rested in the clear light of the Dharmakaya State. Khen Rinpoche, Khenpo Tsewang, Ani Lorraine and Mimi Bailey were present when Lama entered parinirvana. At that moment, the character lines left Lama’s face and his complexion glowed, exhibiting a much younger appearance. There was a profound stillness in the room and Vajrasattva practice continued. 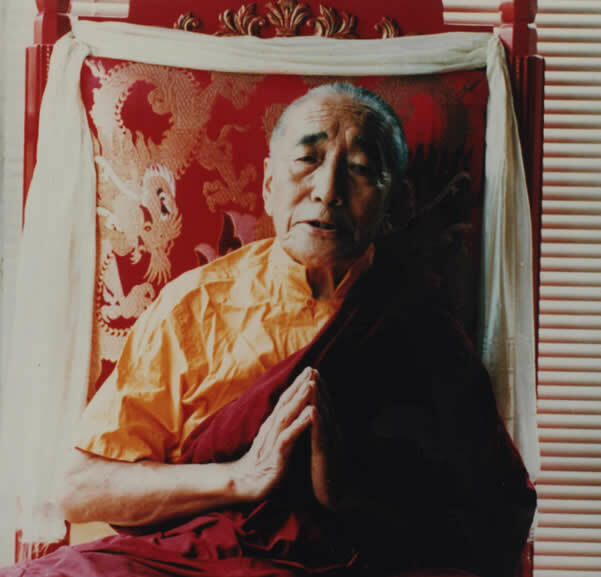 Over the next three days, until it was necessary to move Lama to the crematory, his body was not touched and one of the PBC members who entered his room to sit with him, some 24 hours after his passing, reported that if she had not known that Lama had passed, she would have thought he was meditating – just as we had observed many times over the years that he lived at Mandarava House.